(5:50 p.m. EDT) -- The Caribbean air was muggy and the sky overcast when quirky, high-energy rock band DNCE took the stage at Oasis of the Seas' AquaTheater Monday, wearing lion masks and prowling around to a snippet from The Lion King's "Circle of Life." The event was the start to a busy day of celebrating the "Great American Eclipse," the first total solar eclipse to be seen from North America in 99 years. 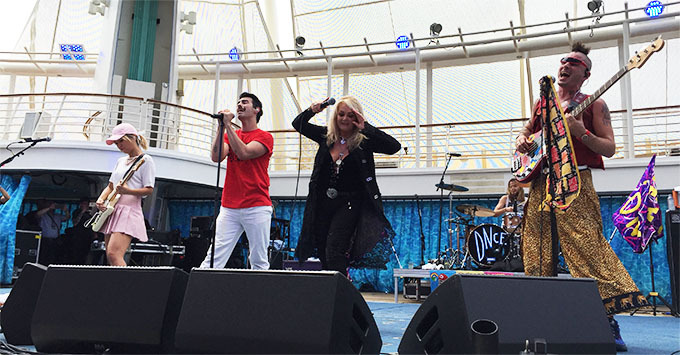 Oasis of the Seas was Royal Caribbean's only cruise ship to be sailing in the path of totality, and the line took full advantage with themed cocktails, a viewing party and a concert with DNCE and "Total Eclipse of the Heart" singer Bonnie Tyler. Led by frontman Joe Jonas, a former Jonas Brother, DNCE -- rounded out by guitarist JinJoo Lee, bassist Cole Whittle and drummer Jack Lawless -- performed everything from its well-known "Toothbrush," "Body Moves" and "Kissing Strangers" hits to covers of the Spice Girls, Kanye West and Britney Spears. The special-invite crowd ate up every lyric, every theatrical puff of steam from the stage and every signature high-kick by Whittle, who, along with Lee, ran up and down the aisles while Jonas hurled T-shirts at cheering teenagers. The band finished off with its most well-known song, "Cake by the Ocean" -- fitting, given the concert's setting. Just when it felt like the performance couldn't possibly be any more over-the-top, out came Bonnie Tyler, who still owns the stage like a boss decades after she began topping music charts. With the band as backup, Tyler and Jonas performed a modern take on Tyler's 80s cult hit as the live crowd sang along. Because space in the AquaTheater is limited, many passengers were forced to watch via a live stream fed into several venues throughout the ship. "Do you have your glasses? 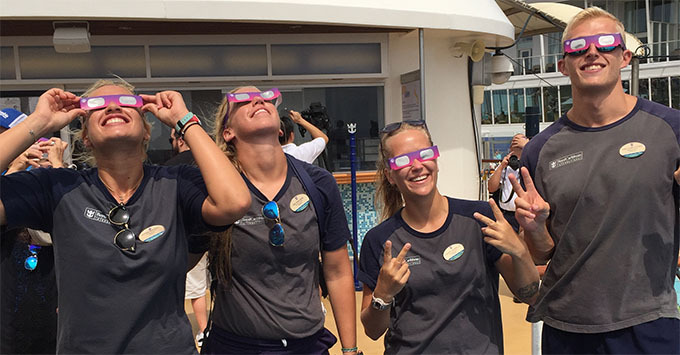 Please make sure you have your glasses," crewmembers reminded everyone as passengers excitedly filed out of the theater, heading for prime viewing spots on the ship's top decks about an hour before totality. Despite a cloudy start to the sailing, the captain -- with the help of Royal Caribbean's chief meteorologist James Van Fleet -- managed to find a patch of clear sky for cruisers to enjoy the once-in-a-lifetime spectacle, which had a sea of passengers stopping what they were doing, putting on their bright purple glasses and turning their heads skyward. The time it took the moon to completely cover the sun, tossing the ship's outer decks into near darkness, seemed far longer than the time it took for the light to reappear, leaving everyone with a sense of awe. Gasps and cheers erupted, and just like that, the bustle of ship life began anew. We're total eclipsing LIVE from Oasis of the Seas in celebration of this once-in-a-lifetime celestial event. Share it now!